Lets face it… there are going to be times when prayer will NOT change what’s going to happen. God is still God and we are still His servants. No matter how much we pray, the outcome will still be the same. 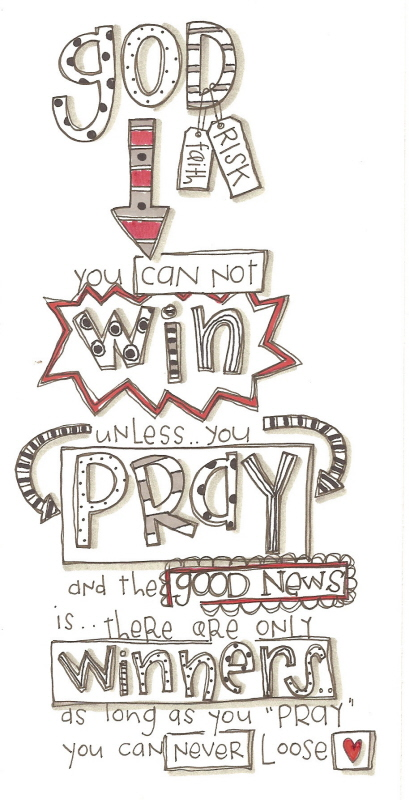 So, why pray? The reason for keeping our prayer life current despite the circumstances was exemplified by Christ in the Garden of Gethsemane. Three times Jesus asked His Father to change His circumstances…. three times He was denied a more favorable outcome. (Luke 22:39-46) It was far better for you and me that God denied His request. 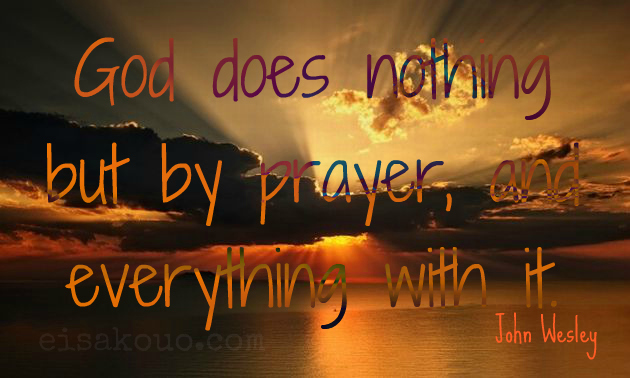 So why pray then… because we still need something from God. Our prayer then becomes more of a confirmation of the known will of God. Maybe you too have been in a place like this. Is God really going to change the capital of France to Tokyo? I don’t think so. Prayer is a powerful tool, but the outcome will still be the same. So do we continue in prayer when we know the outcome will not change? I don’t think Jesus was praying so much for His circumstances to change as much as He was praying against the circumstances changing Him. We know from the Gospel narratives that Jesus warned and instructed His disciples to “Pray that you enter not into temptation.” This warning was given three times. The disciples fell quickly into temptation’s snare… Jesus walked away from the temptation to exit God’s process. When did this “cup” become so important to the Lord. Jesus had never mentioned having to “drink from a cup.” Let me abbreviate here… Drinking from the cup meant Jesus was choosing for Himself to stay in God’s process every step of the way. No deviation. The “cup” was shorthand describing Jesus’ process. I believe also this “cup” was the Father’s language to His Son. Yes, it can be found it scripture. But in Jesus’ mind it described everything He would be going through in the next few hours. I am sure Jesus had prayed about it numerous times. The cup might not speak to you, it might not speak to anyone…. but it sure spoke to Jesus and described precisely what He would be enduring. Have you ever noticed how I sign the end of my blogs? For the past few months I say…”From God’s Incubator.” Now, this means absolutely nothing to anybody else…but to me, it means a lot. It describes what I am going through. One word reveals everything. Where did I get it? From my wife… no, but she heard it from the Lord. We have prayed about our incubator on numerous occasions. It is interesting. When God speaks, you start talking like Him! Why is all this important? Because when you grow in the Lord, it is not about you simply following orders. There is a greater level of obedience. Eventually we each need to grow to a level of choosing for ourselves to be obedient. We stop talking about “God making us do things.” Instead, we are obedient to His word because we want to obey. The Father wants more from us than blind obedience. He wants us to choose His will for ourselves. Every parent longs for the day when their children want to brush their teeth, take a bath, and clean their room on their own. Jesus wasn’t simply going to the cross because God wanted Him to go… He was choosing the path of the cross… Himself. Listen, all Jesus had to do was slip off about 30-40 feet, or even less, and crouch down to pray. No one would have even found Him there. He could have said, “Well, Father, I was there but Judas and his gang didn’t see Me… so I was going to do Your will, but they missed me.” You say they could have caught Him later, but then Jesus wouldn’t have been crucified directly before the Passover. Jesus made sure that Judas’ crew found Him. He basically delivered Himself into their hands. Why? Jesus drank for Himself the cup His Father placed before Him. In closing, there is a verse of scripture that has always troubled me. laying hold of His Will in our lives. Prayer is just an affirmation of what we know is already true. Jesus prayed three times for His circumstances to change… all to no avail. In the end, when all of His close friends abandoned Him, He had the comfort of knowing He was in the center of God’s will. Jesus’ prayer life confirmed it. It is not unusual for Christians to hear a challenging word from God, only to take a step of faith to trust God, and then afterward experience even more difficult situations. During these times we can get very discouraged because it appears our very obedience is the reason for our difficulties. Why would obedience create more problems? Because, God has a higher purpose! The Lord has a higher purpose for your life as well. Luke 1 reminds us God was looking for parents He could trust to bring John the Baptist into the world. Zechariah and Elizabeth demonstrated their trustworthiness, for they did not turn against God or stop serving Him when things weren’t going their way. Their whole married life they had been praying for a child, but were not able to conceive. Yet, they both remained faithful. There is always a choice for us when things are not going our way. We can lose faith and turn from God, or we can totally trust Him. Someone said, “Sometimes a roadblock is not a dead-end, but a detour to a new road in life.” When we let God answer our prayers for His purposes we will probably experience a roadblock like those just mentioned. If we remain faithful to God’s larger purpose, we will discover it is not the end of the road. It is only a change in direction leading us to God’s new destination for our life. Do you want to be used by God for His purposes? Do you want your prayers answered your way, or do you want something bigger and better which God has purposed for you? Zechariah and Elizabeth waited a long time and suffered disgrace and discouragement. But when their prayer was finally answered… it was their son who was chosen to point the world to Jesus. I believe, more than ever before, we need people to point the way to the Lord. I am not talking about people who act religious. As I have stated before, the world is on to us. Who wants to board a plane with a blind pilot! Likewise, we need real prophets, leaders, teachers, and preachers. We need the Lord to raise up real prophets like John the Baptist. In order for this to happen…we must be willing to let God answer these types of prayer in His Own Time, in His Own Way, in His Own Power, and for His Own Purposes. It will not be the easiest road because we will have to grow up in our faith and we will have to accept His plan over our own. Are you ready? 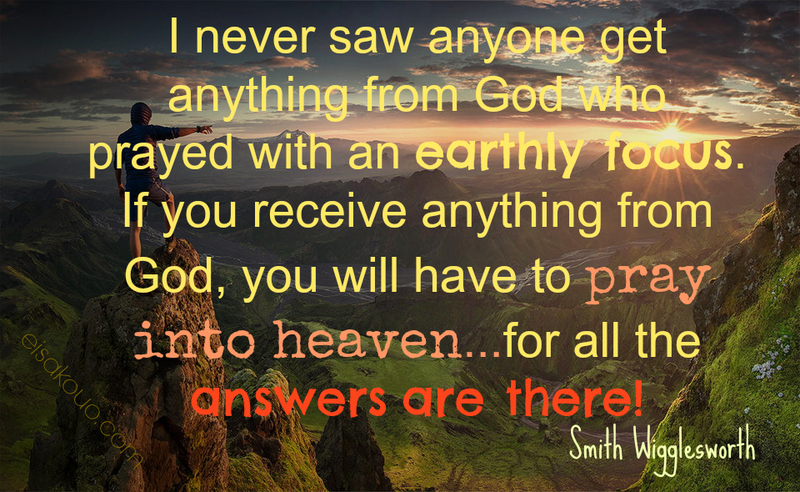 Have you ever tried to help God out while waiting for the answers to your prayers? I’ve been there … got a few t-shirts and learned some hard lessons. The classic Biblical example of a couple trying to help God is Abraham and Sarah. God promised a great nation would come from their loins. Years passed without a son being born. When it appeared God needed their assistance, they took matters into their own hands and had a son (Ishmael) through their servant Hagar. This was not God’s plan, or His promise. I also think of young couples who get married too soon and live to regret it. Our quick/help solutions are almost always the wrong solutions. 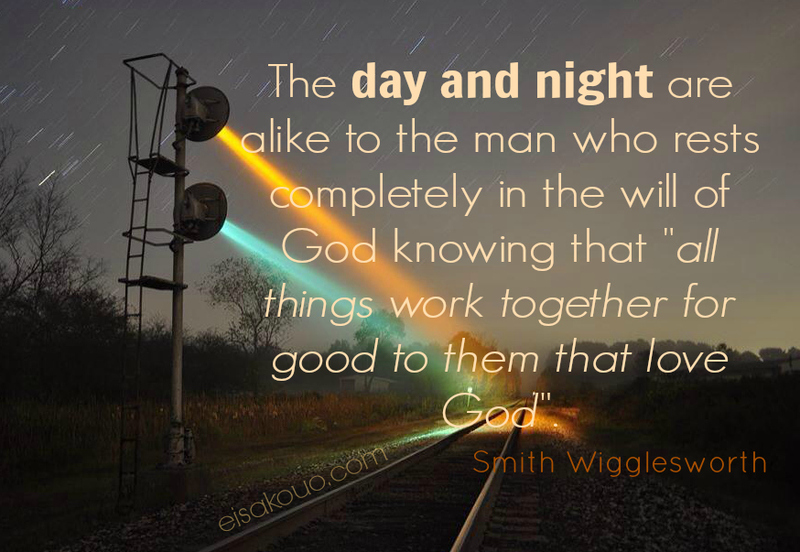 We need to wait for God’s solutions, even if they require a miracle, as it did for Abraham and Sarah! Why does God wait until the last possible moment, when the answer requires a miracle? Why do our circumstances often get worse before He answers? We see this clearly when Jesus raised His friend Lazarus from the dead. Jesus wanted an occasion to reveal His power to everyone. Jesus knew He could count on Mary and Martha because they would not deny Him, even though their “personal prayers” appeared to be going unanswered. Jesus delayed and let Lazarus die to show everyone He had the power over the grave! But those four to five days before Jesus arrived were rough on the sisters. All this reveals that the closer we are to the Lord, the more our faith gets tested. If you consider yourself to be a friend of God, then rest assured… you will be tried. If your prayer has not been answered, don’t give up or act too soon to solve it yourself. Instead, trust God and wait on Him! 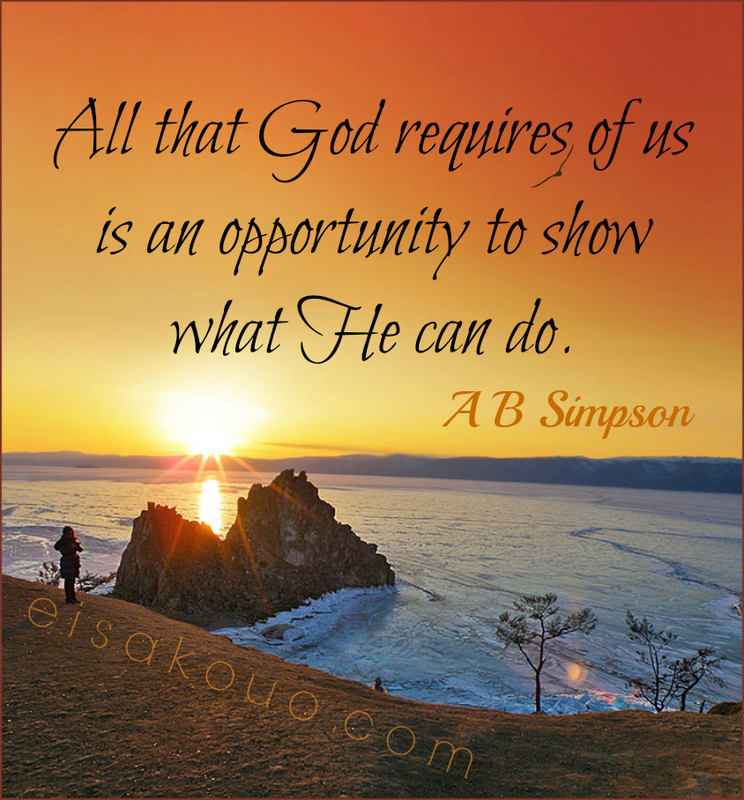 God wants to reveal His power through your situation…. 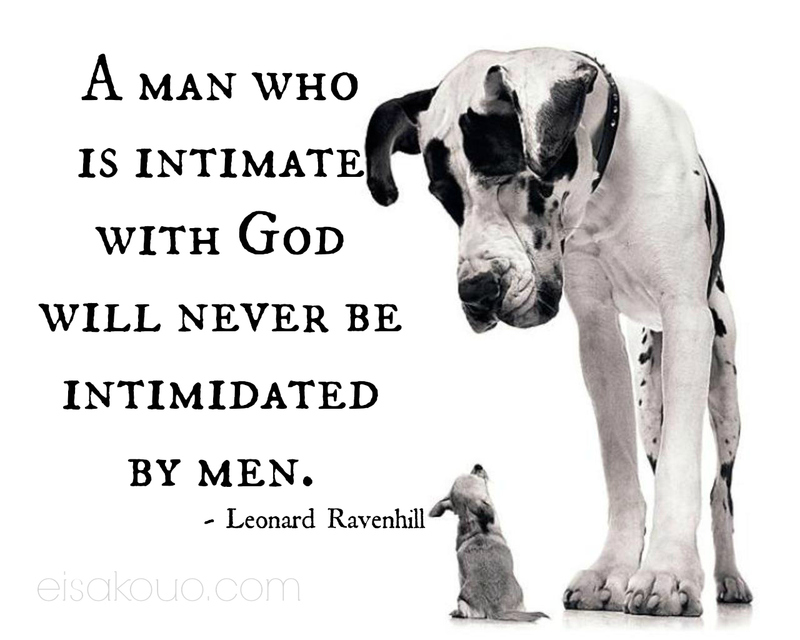 to you and to someone close to you who needs to know that your God is for real! Then one morning in the middle of winter, the little old lady stepped onto her front porch and shouted, “Praise the Lord! Lord, I have no food and I am starving. Please provide for me, oh Lord!” The next morning, she stepped onto her porch and there were two huge bags of groceries sitting there. God tells us up front that His ways are not our ways. His ways are bigger and better…. beyond what we can even think or imagine! If the Lord’s ways are bigger and better, then why do we always appear to be disappointed with His bigger and better stuff? Could it be that we don’t really believe all that “good stuff” the Bible tells us about and are always bracing ourselves for disappointment. There was one clerk in a large candy store who always had people waiting in line, even when the other clerks were standing around with nothing to do. The manager finally asked her why she was so popular with customers. The Lord works the same way with us many times. With one hand, the Lord scoops and delivers a smaller than expected portion, lays it on the counter and watches our response. If we become dejected and despondent, then He knows whether we are totally grateful. If we are truly grateful for His blessings, He then, with His other hand, lays an even greater scoop of blessing on the counter. In Luke 1 we discover that Zechariah and Elizabeth wanted children. So, when things were not going their way, they prayed for God to intervene. They wanted what everyone else wanted and most were getting. But God wanted to give them someone special – a unique son for a unique purpose. God needed a special set of parents to raise a prophet. He delayed their answer because He had a much better answer in mind. Still, day after day, month after month, and year after year, babies were being born to families and friends. This couple saw life move on for other people. For Zachariah and Elizabeth, it didn’t appear too difficult for God to answer the desires and wishes of other parents. One of the keys to receiving from heaven is to not become jealous of what other people are receiving from the Lord. If we continue to think along these lines, bitterness can creep into our thought life. 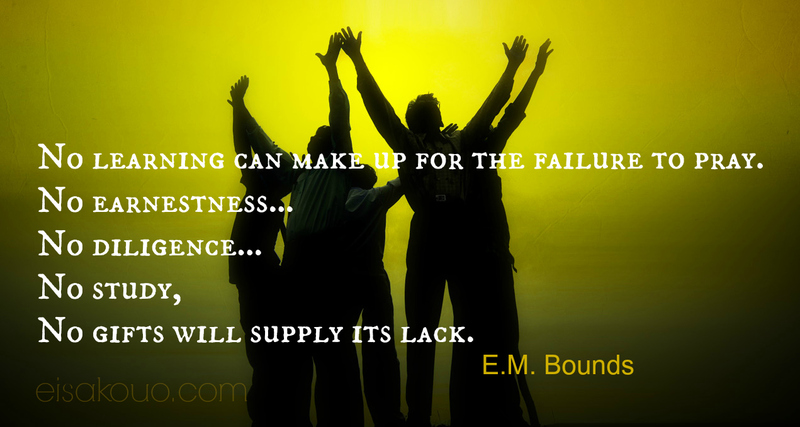 Our problem is that we simply want what everyone else is getting. God never promised He would answer in “fair fashion”. Fair is a man-made standard. If God gave us what is fair, we all would have been destroyed long ago. The Bible does say the Lord is “merciful, kind, and just” and He will answer accordingly. When our prayers are delayed, most become content to settle for less than what God originally promised. The key is to not become disenfranchised over a delay. Do you believe this verse? Trust the Lord and release the power which is at work with you! Touché! A quip like this had to hurt just a little. Why doesn’t prayer “really work” sometimes? 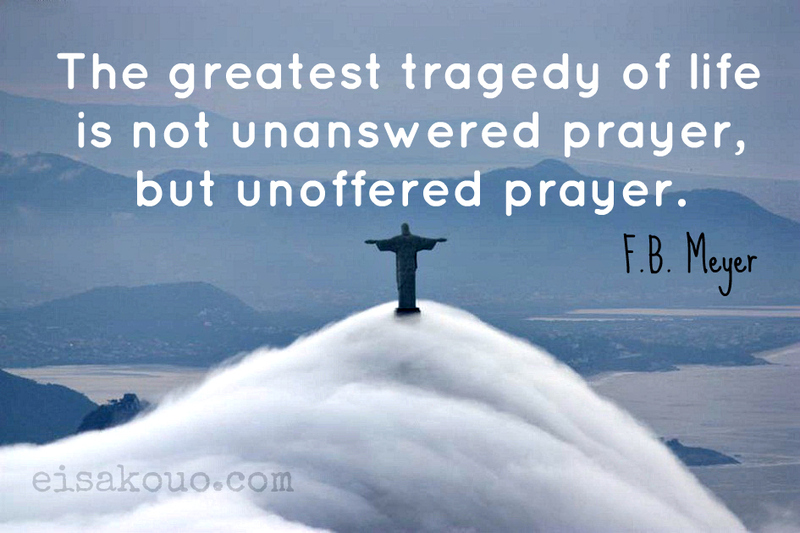 Why do some of our most earnest and sincere prayers appear to go unanswered? In this blog and following, I am going to focus on our attitudes in prayer. My focus is not about “the how to’s” of prayer, or the “whys” of prayer, but our attitudes. Maybe you’ve sincerely attempted prayer but are still not netting many results. If so, then follow along as I attempt to examine four attitudes which will help get results from heaven. Time is one of the biggest issues most face when it comes to prayer. In order to receive from God we must be willing to let the Lord answer in His own time. If you are like me… I want what I want, when I want it. I want answers to my prayers right away. After all, I think that what I’m praying about is important and God should answer…quickly. But it’s not always in my best interest or God’s, for Him to answer immediately. During these moments it is imperative to maintain the belief that the Lord has our best interest at heart. If the Lord delays, it is the very best for all concerned. God often delays answering our prayers because we are not mature or responsible enough to receive. The question becomes can we handle it? A hundred years ago, who would have thought it would have been possible to send pictures through space? Who would have imagined that somebody standing in front of a camera in New York could be seen by people in Washington? Who could have imagined that instead of waiting for the news to arrive in a newspaper, you could see it happening for yourself, live? A hundred years ago they would have said it was impossible. This is not the case now. Who would have thought a hundred years ago, it would be possible for people personally to send their own pictures and videos through space to be on the news which runs 24/7. Yet, this happens everyday. Now, even children and teenagers have this capability. Many have learned the hard way that just because they can, doesn’t mean they should post every pic and video of themselves. Many of them have chosen to send naked pictures of themselves for the whole world to see. Just because we have been given this power doesn’t mean it has been the very best thing for us. Being willing to wait for something you want or even need is a sign of maturity. Not being willing to wait is a sign of immaturity. This wasn’t the reason Zechariah and Elizabeth’s answer was delayed in Luke 1. In verses 6 and 9 we see that they were upright, blameless, and kept faithfully serving God despite their disgrace and disappointment in not having a child. Yes, this elderly couple was “disgraced” by God’s lack of movement in their lives. Ever been there? Do you think God is even concerned when He delays our prayers? Maybe He is in heaven laughing at our disgrace. People wrongly conclude we are “less spiritual” because God has delayed our prayer requests. Real maturity is loving God despite it all. Mature people do not stop loving God when life doesn’t make sense. Zachariah and Elizabeth kept plugging away with their faith and love for God intact. 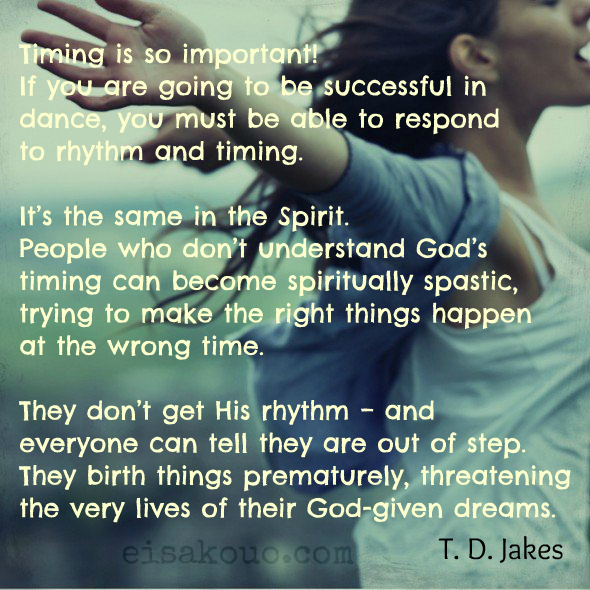 As strange as it may seem, God’s delays are not God’s denials! He needed someone He could trust to not deny Him when their prayers weren’t being answered right away. He wanted to answer Zechariah and Elizabeth’s prayers in a miraculous fashion. This meant that their answer would not arrive right away. This also meant they were the “exceptional parent material” God needed to raise a prophet… not just any prophet … the prophet that would usher in Messiah. Here is a man who didn’t pass the “prayers delayed test.” In fact, this test actually changed the course of his life. His personal prayers were not answered by the Lord, so he chucked his whole relationship with God. I am sure we have all considered giving up on prayer at one time or another. We get discouraged and quit praying for a season because deep down we wonder if prayer really makes a difference. In Zechariah and Elizabeth’s case, God wanted to do something greater than they had originally requested. God trusted them because they would not give up on Him when their prayers seemed to be going unanswered. Have you given up on God because He appeared to be deaf to your concerns? Or, are you still faithfully serving Him despite the delay in getting what you have been praying about? 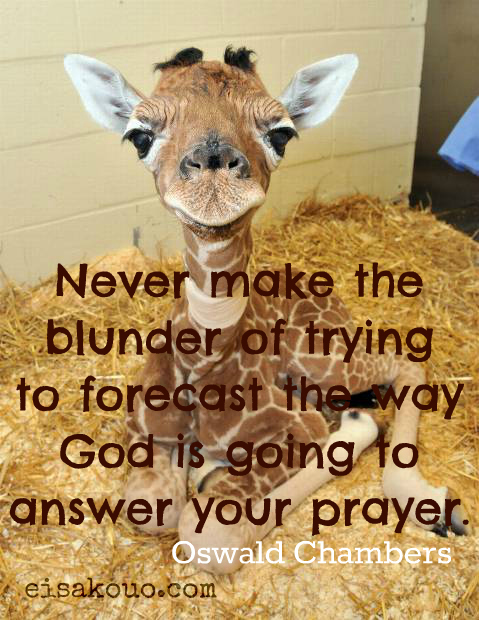 Can God trust you to not deny Him when the answers to your prayers are delayed? Zechariah couldn’t believe the angel’s good news. He doubted what he was hearing. Even good, sincere Christians have doubts at times! Why did he doubt the angel’s message? Because he knew he and his wife were “well along” in years. I am feeling a little advanced in years myself these days. They knew that it would take a full-blown miracle for them to have a child! We tend to doubt God when the answer to our prayers requires an actual miracle. This is the difference between Mary (Jesus’ mother) and Zechariah. Mary did believe God could do a miracle. Zack, because of his age… couldn’t make the leap.